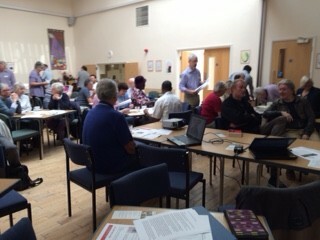 Laudato Si’ and Green Christian’s ‘Joy in Enough’ project have roots in the spirituality of St Francis, Paul Bodenham, Chair of Green Christian, told the September gathering of National Justice and Peace Network in Coventry last Saturday. ‘New’ or ‘green’ economics challenge the prevailing orthodoxy of the need for growth as the basis of prosperity, as this is unsustainable for the planet and tends towards greater inequalities of wealth. He put this in the context of the principles of Franciscan spirituality – fraternity (we are all sisters and brothers), equality, penance (as a joyful rediscovery of our humanity), incarnation and ‘bonum’ – the good (the value of everything that is). He felt these were picked up in Laudato Si’, Pope Francis’ recent encyclical on the environment, which itself contains a critique of the economic system and the need to link concern for the environment with action to tackle poverty and inequality. The meeting brought together around 40 people from dioceses, agencies, religious orders and local justice and peace activists. The current refugee crisis was of course high on the list of concerns for those present, with information being shared on how dioceses are responding to government plans, and how to channel the goodwill of those offering help. (See www.catholicchurch.org.uk to find your diocesan contact). Alison Gelder of Housing Justice pointed out that there are existing organisations which co-ordinate offers of hospitality for those who are destitute, whether refugees or indigenous homeless people, and urged anyone who could offer accommodation to do so. (In London: Housing Justice www.housingjustice.org.uk; Outside London: No Accommodation Network www.naccom.org.uk). As members of the Strategic Alliance on Migrant Destitution they will be holding events to bring refugee/migrant and homelessness organisations together and various cities between November and March – email a.gelder@housingjustice.org.uk to find out more. There was concern that government funding may not be adequate for cash strapped local authorities to deal with the refugees being resettled under the government programme, and the decision to take money from the overseas aid budget was also criticised. NJPN has drafted a letter to send to MPs to raise these concerns (contact admin@justice-and-peace.org.uk for a copy). The slowness and inadequacy of the government’s response to taking in refugees was contrasted with the welcome given the week before to representatives of repressive regimes to the Arms Fair in London, encouraging the sale of arms which fuel the conflicts and repression from which many of the refugees are fleeing. The meeting heard from the NJPN Environment Working Party of plans to call on all dioceses to draw up environmental policies. There were also opportunities for representatives of dioceses and agencies to share in campaigns and upcoming events.